Sesame Street Club with basketball hoop inside FOR SALE Buy it Today! FOR SALE Buy it Today! We Can tell you how to get to Sesame Street! Come join all your child's favorites right here - Elmo, Big Bird, Ernie, Oscar, Grover, everyone is here! Bonus basketball hoop inside for an extra treat! Big Bird, Ernie, Bert and Cookie Monster's friends arrive to build the Sesame Street & Friends Club House bounce & basketball hoop moonwalk rental for your young Sesame Street fan and their entourage to safely jump, bounce and moonwalk. The Sesame Street & Friends Club House bounce & basketball hoop is 15 feet in length by 15 feet in width, by 16 feet in height. This unit sets up on a diagonal space, not square. 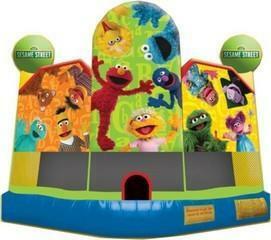 The Sesame Street & Friends Club House bounce & basketball hoop rental will be delivered to your home or party/event location and be set up for you. Sesame Street Club House can accommodate from 9-10 small children at a time, with a 500 lb. limit. Suitable for children 12 years and under, minimum height 30”. Unit is not acceptable for adult use. You must have a flat area, 17´ x 17´ big for this castle. This unit even has a basketball hoop inside to shoot some hoops while they play with all their favorite licensed Sesame Street friends all aboard the club house! Includes manuals, safety and setup training.